Flagstone Peak (13,446–13,486 ft (4,098–4,111 m)) is located in the Wind River Range in the U.S. state of Wyoming. The peak is the 13th highest summit in Wyoming. The summit is located in Shoshone National Forest and the Heap Steep Glacier lies on the north slopes of the mountain. ^ a b c "Flagstone Peak, Wyoming". Peakbagger.com. Retrieved May 26, 2013. ^ "Sunbeam Peak". Geographic Names Information System. United States Geological Survey. Retrieved May 26, 2013. ^ Fremont Peak North, WY (Map). TopoQwest (United States Geological Survey Maps). Retrieved May 26, 2013. 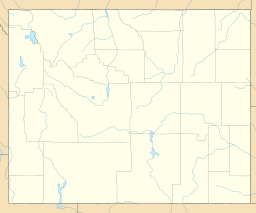 ^ "Wyoming 13,000-foot Peaks". Peakbagger.com. Retrieved May 26, 2013. This page was last edited on 23 January 2019, at 16:56 (UTC).